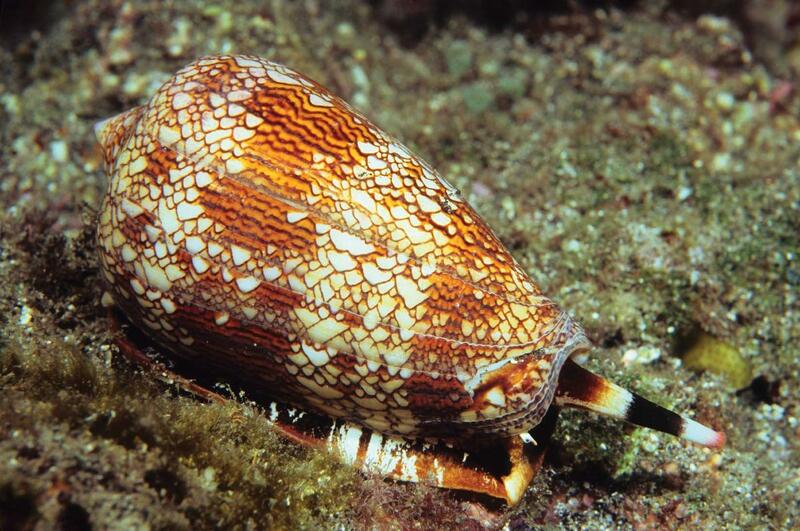 Cone snails are marine gastropods characterized by a conical shell and beautiful color patterns. 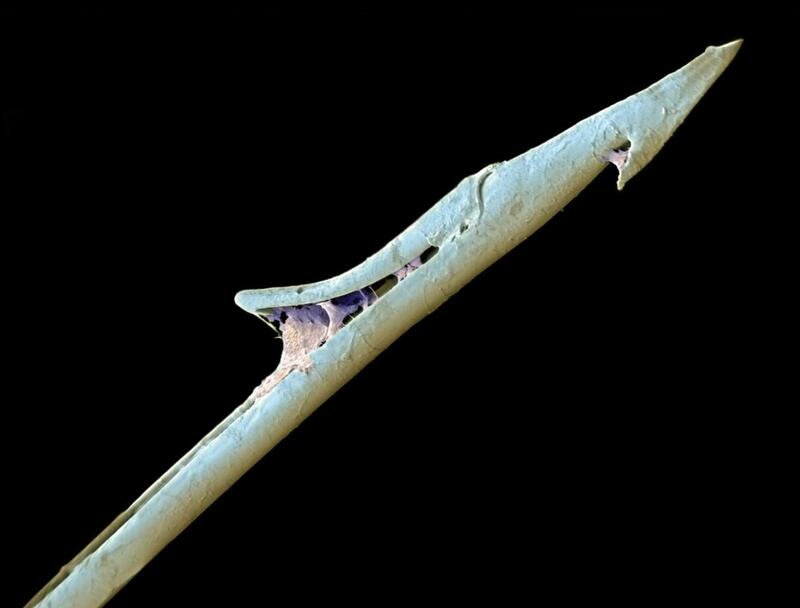 Cone snails possess a harpoon-like tooth capable of injecting a potent neurotoxin that can be dangerous to humans. There are about 600 different species of cone snails, all of which are poisonous. Cone snails live in shallow reefs partially buried under sandy sediments, rocks or corals in tropical and subtropical waters. Some species have adapted to colder waters. Injuries typically occur when the animal is handled. Cone snails administer stings by extending a long flexible tube called a proboscis and then firing a venomous, harpoon-like tooth (radula). A cone snail sting can cause mild to moderate pain, and the area may develop other signs of acute inflammatory reaction such as redness and swelling. Conustoxins affect the nervous system and are capable of causing paralysis, possibly leading to respiratory failure and death. The prevalence and incidence of cone-snail envenomations is unknown, but it is probably a very rare occurrence in divers and the general population. Shell collectors (professional or amateur) may be at higher risk. If you see a beautiful marine snail that looks like a cone, it is probably a cone snail. It is difficult to tell whether a cone snail inhabits a given shell as they are able to hide inside them. Since all cone snails are venomous, err on the side of safety, and do not touch it. Unfortunately, there is no specific treatment for cone-snail envenomations. First aid focuses on controlling pain but may not influence outcomes. 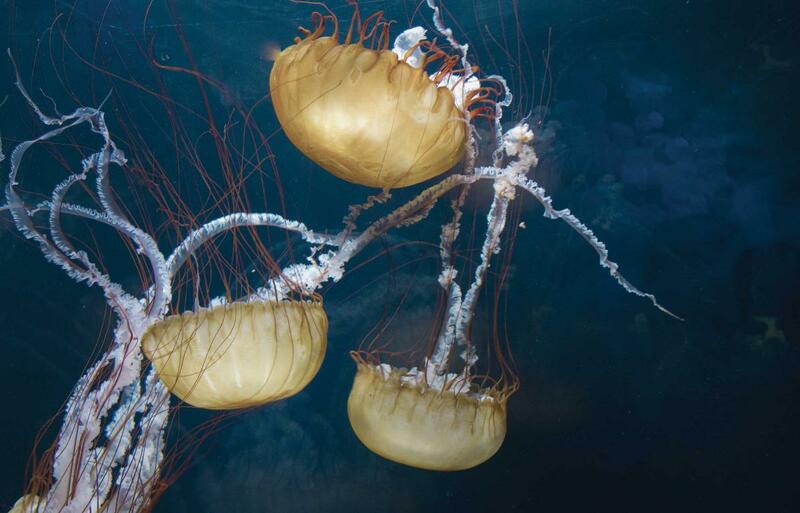 Envenomation will not necessarily be fatal, but depending on the species, the amount of venom injected, and the victim's size and susceptibility, complete paralysis may occur, and this may lead to death. Cone-snail venom is a mixture of many different substances including tetrodotoxin (TTX). NOTE: Application of heat might help with pain management, but since TTX is a heat-stable toxin, the application of heat will not denature the toxin. — Be prepared to provide mechanical ventilations with a bag-valve mask device or a manually triggered ventilator. — Do not wait for signs and symptoms of paralysis. Always seek an evaluation at the nearest emergency department.